Last week we ran another case-based learning session. The session consisted of a short discussion based around a case that we were tasked that involved a patient with a suspected pneumothorax. 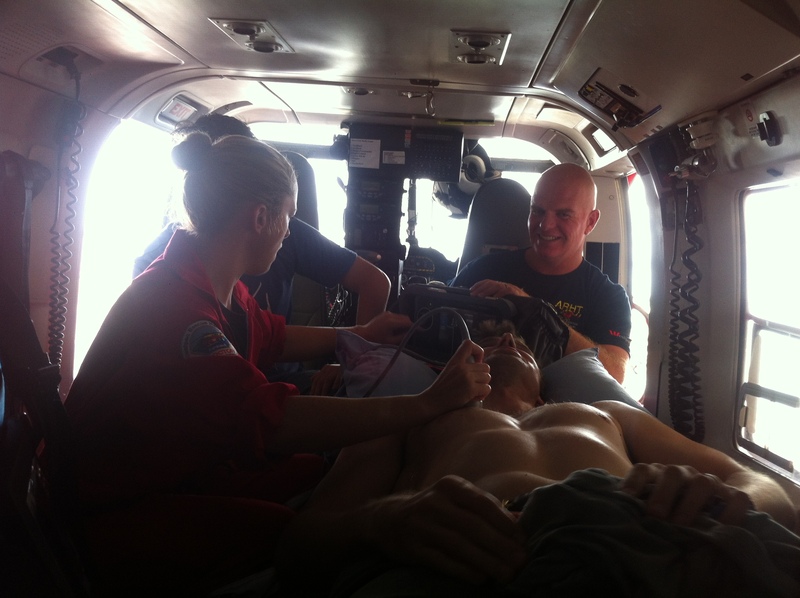 We discussed the issues and challenges of managing a patient on the ground and in-flight with a pneumothorax. In addition, we discussed then practiced how we can use ultrasound as an added tool in the diagnosis of a pneumothorax in the prehospital setting. One theoretical approach was proposed – in a patient with pneumothorax that was reasonably stable, consider anesthesitizing & exposing the site for a chest drain then proceed with finger thoracostomy if deterioration. Several clinicians felt that it there was such concern to proceed with local anesthesia then probably a drain should just be placed. Knowledge regarding pneumothorax is key depending on the location of the patient. In situations on the east coast of the Coromandel then altitude becomes extremely important. A little in-situ training. Enabled us to figure out optimal ergonomics and positioning for in-flight ultrasound. This entry was posted in Education, HEMS Personnel, Simulation, Ultrasound and tagged ergonomics, HEMS personnel, ultrasound, usability testing by petro82. Bookmark the permalink. Another successful case-based learning session at ARHT.